The State Bank of India, popularly known as SBI, is India’s largest commercial bank with a glorious history of more than 200 years. State Bank of India, owned by The Government of India, is categorized as an Indian multinational, public sector banking and financial services company, with its headquarters located in Mumbai, Maharashtra. With more than 14,000 branches in India, SBI is the largest and one of the premium banking and financial services company in India by assets, deposits, profits, branches, customers and employees. SBI has also established and secured its roots globally with 191 foreign offices spread across 36 countries. State Bank of India is one of the Big Four banks of India, along with ICICI Bank, Bank of Baroda and Punjab National Bank. As of 2016, SBI is ranked 232nd on the Fortune Global 500 list of the world’s biggest corporations, and stands as the proxy for the Indian Economy. SBI was ranked 152nd in The Forbes list of Global 2000 firms in May 2015. The Government of India owns 58.60% of SBI and thus is the largest shareholder of SBI, a Fortune 500 company. State Bank of India, the oldest commercial bank, traces its ancestry to the 19th century (British India) when the Bank of Calcutta was founded in 1806. In 1921, the Bank of Calcutta, merged with the banks of Madras and Bombay to form the Imperial Bank of India. In 1955, when the Government of India nationalized the Imperial Bank along with the RBI, the Imperial Bank acquired the name State Bank of India. Since its beginning, SBI has been constantly endeavoring to provide utmost customer satisfaction to the most ideal degree. State Bank of India provides several ambitious employment opportunities for young graduates as well as experienced professionals for accelerated career growth. 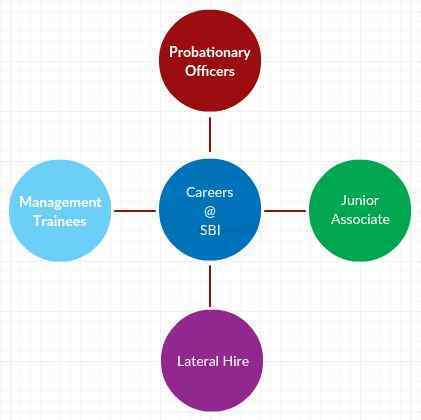 SBI is prominently known for being one of the largest employers of probationary officers and special officers in India. According to the Google search trends, SBI jobs is one of the most searched keywords in 2016 as compared to other banks. SBI ensures an amicable, collaborative, composed, dynamic, motivating, exciting, and a fast-paced work environment for both professional and personal development. Learning is a constant process for all the employees associated with SBI. SBI offers excellent career opportunities and welcomes applications every year for different positions all over India. SBI believes in providing superior performance to all its customers and therefore takes the continuous initiative in hiring best and dynamic individuals aspiring to excel. To employ the most prominent individuals, SBI conducts exams and interviews for different roles. Once hired, SBI ensures the development and growth of all its employees by providing personal guidance and motivation. Following are the different career positions for which SBI Recruitment drive is conducted on a yearly/necessity basis primarily in the months of April and September. As described by SBI, the roles/designations of different positions are classified into categories as below. Click Here for a detailed description of each of these roles and the application process.